With advanced color technology from Xerox, there is no reason to continue outsourcing full-color print tasks. The ColorQube 8900, available through Pacific Office Automation, provides users with vibrant color printing—page after page, year after year—with a long list of unique multifunction printer abilities to choose from. This model provides users with advanced printing technology that uses a system different from the traditional ink cartridge. Because of this, the ColorQube 8900 is a much more efficient piece of office technology than its counterparts. This multifunction printer delivers a low cost of ownership—unmatched in its class of products—and lets you more efficiently use your office space because of its compact size. With a 2,400 FinePoint print resolution, your office is assured exceptional vibrancy in each print job, even as you use this machine frequently. This model also provides you with the Color By Words feature which makes color correction fast and easy with a drop-down modifications list. As a multifunction office machine, this printer excels. A full-color interface in the front of the machine lets users select from a variety of copy, scan, email, and fax options using easy-to-read graphics and directions. Users can also scan files and create digital documents, streamlining intra-office communication while moving toward the sustainable paperless operation of the future. Along the same lines, the ColorQube 8900 demonstrates countless environmentally-friendly efforts. Cartridge-free solid ink sticks come with minimal packaging and generate up to 90% less printing waste than comparable laser printers. This model also uses less energy over its lifecycle when compared to other printers in its class, making it worthy of its official Energy Star rating. 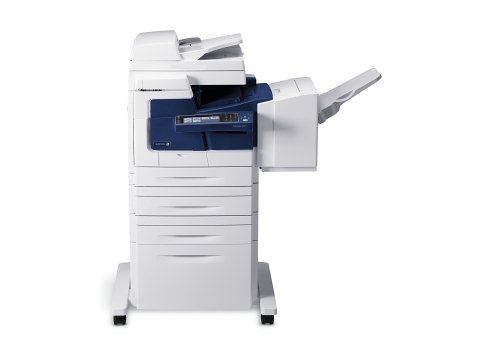 For sustainability and performance, add the ColorQube 8900 to your existing office technology. The ColorQube 8900 comes with One each of Xerox® Genuine Solid Ink sticks (capacity: 2,250 pages black1; 2,100 pages color), Cleaning unit (standard capacity: 10,000 pages), Staple cartridge (installed), Power cord, Fax cord, Software and documentation. The ColorQube 8900 delivers a low total cost of ownership (TCO) unmatched in its class of products. Flexible pricing plans give you the luxury of no longer paying expensive per-page prices for low-coverage color documents. You’ll also save money and precious office space when you combine printing, copying, scanning, emailing and faxing, plus a standard convenience stapler, into one powerful desktop device. The ColorQube 8900 features Xerox-exclusive Solid Ink technology, which gives your documents rich, vibrant colors on a wide range of media, including recycled paper. With up to 2400 FinePoint™ print resolution, you’re assured exceptional print quality, with consistency you can count on page after page, year after productive year. PANTONE® calibrated solid-color simulations and exclusive Xerox color correction technology deliver results that always match your expectations. The ColorQube 8900 also includes the Color By Words feature, which makes color correction fast and easy, allowing you to select desired color modifications from a simple drop-down list.